I have been looking for a way to change the color of a few materials without too much in the way of cost or without much in the way of mess/trouble. 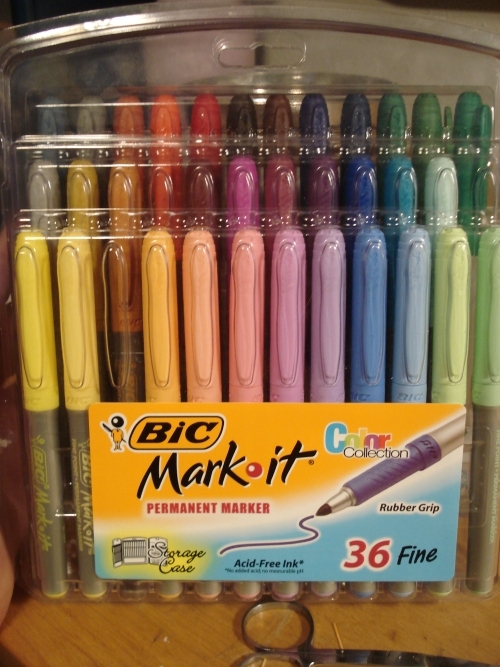 After doing some research (on google) I found a post at Fly Art Studio regarding the Bic-Markit line of permanent markers. According to the post these relatively cheap markers ($18.99 at Shopko in Winona) withstood several days in both water and salt-water solutions and still held their original color and they are non-toxic so I’ve got to think if I can put them in my mouth I should be able to put them in a trout stream. I was certainly intrigued and ran out to find the markers for myself. Note: Get the 36 count, it has several more shades that will make the fly tyer in you scream and if you short change yourself [singlepic id=727 w=160 h=120 float=right]with the 24 pack your going to be kicking your own arse. Once home I whipped up an initial pattern and got to dunking, drying, and rubbing to determine if they were truly worth my time and effort. I should also point out that I’ve never used markers and haven’t tried the PrismaColor Brand of fly tying markers but the post I read claimed these out performed those markers. Two days later and my original test subject look the same, wet, but the same. Success! Note: After four days in water a test subject made of only thread lost some of its dye to the water. These flies I’ve tied here seem to be weathering the water better due to the Micro Stretch Tubing wrapped tightly around the body so far after four days they are still the same flies, probably more than the amount of time needed to take a few trout. Do not use any kind of Zap-A-Gap or super glue on this product because it reacts with the dye changing the color and making everything nasty. Wanting to work on a few new patterns this off-season I pulled out materials to tie a Barr’s Graphic Caddis, I found this over at Charlie’s Fly Box. This is a great site for gathering ideas and looking over different patterns. For my test subject I used a standard curved scud hook but for the real deal I pulled out my secret stash of discontinued Mustad 31760’s as I LOVE THIS HOOK and can’t fathom why it would be pulled from production. I used the markers to gussy up a few soft-hackle feathers that frankly annoyed me until now due to their lack of color, they don’t match anything in our waters. I did the same with a standard lemon wood duck feather to make the antenna a bit more natural looking. Remembering the few Caddis Pupa I saw on stream this summer I was looking for more of a darker front with a brightly colored bulb suspended in the middle somewhere. I used white tying thread to start the fly and form the body, at the point when you are ready to color the thread whip finish and clip it forming a nicely reverse tapered body, something like what Charlie has listed in his instructions here. Coloring with the markers is easy but be careful to color only what needs to be colored, you won’t be able to wipe it off later and also don’t doddle holding the marker in one spot. Once it touches thread, for example, the dyes begin to flow and if you hold it there you will get a darker shade than you might be expecting. I suggest testing each shade you think you might use on a scrap material to see its affects. So far I’ve used it on the Partridge Soft-hackle feathers, the lemon wood duck and tying thread. I like how it shades but does not eliminate the mottled look to the feathers. Do not use it on Ostrich Herl as it gums up the fibers. I tied a few of these up with different colored bodies using different shades of the lighter colored markers. I’m hoping this pattern gets used a ton, about 5-6 months from now. Thanks Tim, I will for sure be posting how these markers hold up to a serious amount of work. Take care as well. JP, I thought I had found every place that had the 37160’s in #14 and smaller, I’m curious if some suppliers are holding out, I note the two dollar increase on athe price of 100 but I’m still getting them. Nice! I recently bought the 24 pack… I didn’t see a 36 pack– dangit! Ah well… still some decent colors and they’ve come in handy numerous times for me already– great looking graphic caddis by the way. Looks really great when it’s wet!